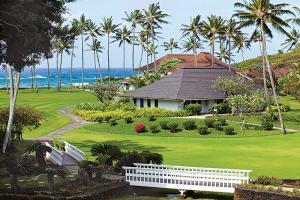 This beautifully appointed resort occupies a lovely beachfront in Poipu on the sunniest side of the island. The architecture at this picture-perfect oasis by the sea is reminiscent of Hawaii's 19-century plantation past. Spacious one- and two-bedroom units, each tastefully furnished with a living and dining area, include a complete kitchen and private lanai. A pristine stretch of sand invites you to swim and snorkel. Includes complimentary in-room Internet access and daily parking. On Poipu Beach, approximately 30 minutes from Lihue Airport. Plantation Gardens Restaurant & Bar and Barbecue Facilities On Site.